Happy New Year! Here's a roundup of five medical studies published this week, while you were celebrating, that might give you new insights into your health, mind and body. Remember, correlation is not causation – so if a study finds a connection between two things, it doesn't mean that one causes the other. Drivers put themselves at higher risk of crashing when they're multitasking, especially if they're new to driving, a new study finds. Researchers found that when a novice driver dials a cell phone, he or she is eight times more likely to be involved in a crash or near-wreck than an alert teenage driver would be otherwise. An adult dialing a cell phone is 2.5 times more likely to get involved in a crash or near-crash than an alert adult who is not dialing. "All drivers, but especially novice drivers, need to keep their eyes on the forward roadway to reduce their crash risk," said Charlie Klauer, research scientist at Virginia Tech Transportation Institute, in an e-mail. 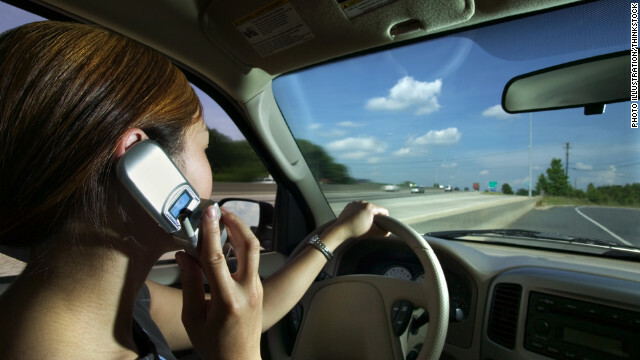 The act of talking on a phone, however, did not increase the likelihood of crashes for the drivers, perhaps because talking doesn't take the driver's eyes away from the road. Based on this, Klauer and colleagues believe that "well-designed, truly hands-free devices would be safer than hand-held devices." Klauer was surprised by how much higher the risks were for novice drivers compared to adults, and how many secondary tasks - such as reaching for a phone or other object, or looking at a roadside object - were far riskier for teenagers compared to adults. "Novice drivers are at especially higher risks because they are still learning what constitutes roadway hazards and how to best negotiate the roadway during higher risk/complex roadway environments," she said. "They need to keep their eyes and attention on the forward roadway to best learn these skills and keep themselves safe." There's nothing like a good novel, right? Researches have found that reading these works of fiction may actually change your brain, too. A new study followed 21 Emory University undergraduates as they read the novel “Pompeii" by Robert Harris. The book portrays true events in a dramatic way, says Emory neuroscientist Gregory Berns, lead author of the study. Researchers divided the book into nine sections and quizzed students to make sure they had indeed read each of them. During the course of the experiment, researchers used functional magnetic resonance imaging (fMRI) to scan the brains of the readers after they had finished their assigned chapters. The students underwent brain scans after reading each of the novel's nine sections. Researchers do not know how long these brain changes last. “But the fact that we’re detecting them over a few days for a randomly assigned novel suggests that your favorite novels could certainly have a bigger and longer-lasting effect on the biology of your brain," Berns said. There are reasons why it might be good to temper the "high" that comes with marijuana, such as in developing addiction therapies. Scientists are on their way to finding out how. A new study finds that a hormone that occurs naturally, called pregnenolone, diminishes the activity of the brain's type-1 cannabinoid receptor. This have the effect of muting the "high" brought on by THC, the active ingredient in marijuana. Researchers did this experiment on rodents, so it's unclear what would happen in humans. At least in these critters, THC intoxication was otherwise associated with memory loss and increased appetite, but the hormone seemed to counteract those effects. After an injection of prednenolone, rodents who were already conditioned to seek cannabinoid stimulators were less likely to do so. But don't try this at home, says University of Bordeaux neurobiologist Pier Vincenzo Piazza, who was the lead author of the study. “Pregnenolone cannot be used as a drug by itself,” Piazza told the Los Angeles Times. When the normally clear lens of the eye becomes cloudy, that's called a cataract. A new Swedish study suggests that antioxidants may help prevent them. Researchers examined the diets of more than 30,000 middle-aged and older women in Sweden. They followed them for about seven years and gave the women a questionnaire about their diets. Foods that are rich in antioxidants include coffee, oranges and whole grains. Women who had a higher intake of antioxidants tended to have fewer cases of cataracts than women who ate less of them, researchers found. The conclusions are line with previous studies, but should still be taken with a grain of salt. "The women participants simply reported on a questionnaire the food choices they made over the past year," William Christen of Brigham and Women's Hospital and Harvard Medical School told Reuters Health. "As an observational study, there is always concern that women who choose healthier diets may also differ in other important ways, like body weight, smoking habits, aspects of the diet other than antioxidants, that may be more directly related to cataract risk." Yet another reason to get a good night’s sleep: A small Swedish study suggests that there may be brain damage associated with staying up all night. There were only 15 participants – all healthy young men in Sweden – so this may not apply to the general population. But it goes along with previous research linking sleep disturbances in older adults with risk of Alzheimer’s disease. In this study, the men slept eight hours in a laboratory, and then stayed up all night playing board games and watching movies. Then, researchers examined blood levels of proteins associated with brain injuries. The study found that the levels of these proteins were, on average, 20% higher after the night without any sleep, compared to after full night of sleep. This doesn’t mean that losing a night of sleep is the equivalent of a concussion. But if you regularly go without sleep for entire nights, if brain areas do become damaged in the process, it’s possible that chronic memory loss could result, lead study author Christian Benedict, of Uppsala University in Sweden, told Boston.com. ANDERSON COOPER YOU ARE A SPY. ANDERSON COOPER TU ERES UN ESPIA. LEE NUESTRA PAGINA PARA QUE VEAS LO QUE HACEN CON TIGO. LISTA DE PRODCUTO ESPEREMOS QUE NO NOS HAKEEN LA PAGINA YA QUE ESTA COMPROBADA. HOW TO FIND MORE RESOLUTION IN A IMAGE. ESPIONAJE DILATANDO LAS PUPILAS DE LOS OJOS POR QUE MUJERES TIENEN LA PUPILAS MAS GRANDES. EXTRAÑO SERA GENÉTICA O SOLO NANOTECNOLOGIA?. Y ADEMAS UNA TORMENTA HERCULES NO APOSTAMOS PERO VA A DURAR MAS DE LOS NORMAL ANTES CON DARPHA AHORA CON SATELITES. DARPHODROMO EN LATINO AMERICA SIENDO DESMANTELADO. Thank you Dr. Sebi for curing my herpes. Please contact Dr. Sebi on Email: info.drsebiscellfood@gmail.com for any kind of disease cure so that your health can be restore.